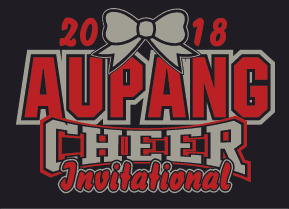 AUPANG CHEER INVITATIONAL Apparel - PRE-ORDERS are now available to order online! FIRST - CLICK ON THE "START YOUR ORDER HERE" LINK BELOW TO ENTER YOUR CHEERLEADER'S NAME, AND TEAM. ORDER DEADLINE IS FRIDAY, OCTOBER 5th.. No orders will be taken after this order deadline. All orders will be held until the order deadline, then processed in bulk. All orders will be ready for TEAM PICK UP on Saturday, October 20th, the morning of the Invitational. A representative from each organization will pick up your orders in bulk and distribute them. There will be a LIMITED selection of AUPANG INVITATIONAL apparel available the day of the event. This will be first come, first serve until it's gone. ALL ITEMS HAVE GLITTER PRINTS - LOGO ON FRONT, TEAM LISTING ON BACK. VERY IMPORTANT - THERE ARE NO RETURNS OR SIZE EXCHANGES ON THIS SPECIAL ORDER MERCHANDISE. SIZING SAMPLES OF THE CHEER PACK ITEMS WILL BE PROVIDED TO EACH ORGANIZATION SO THAT THE GIRLS CAN TRY ON APPAREL BEFORE YOU ORDER. Please select your size carefully. All orders are custom made to order and may not be returned for size exchange or refund. There is also a size chart on the description page of each item. Please be sure to check that size chart before ordering.